Strawberry Avocado Chicken Salad recipe filled with fresh berries, Feta, avocado & grilled chicken. A light salad topped with healthy balsamic vinaigrette. Season both sides of chicken breast with salt and pepper. Place chicken on the grill and grill each side for 5-6 minutes or until there is no more pink. Remove from grill and let sit. In the mean time, to a small bowl add balsamic vinegar, olive oil, dijon mustard, raw honey, dried basil, salt and pepper to taste. Whisk together. 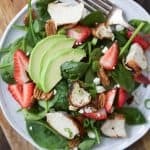 In a large bowl, add spinach, strawberries, avocado, pecans, crumbled feta cheese and then top with sliced grilled chicken. Serve with Balsamic Vinaigrette.